"I use basa fish fillets. They are mild, sweet, firm-textured and can be dressed up with just about anything. There aren't many recipes for basa out there, so I created my own using my favorite flavors." Place fish in a baking dish and drizzle melted butter over fish; season with garlic powder, garlic pepper seasoning, and salt. 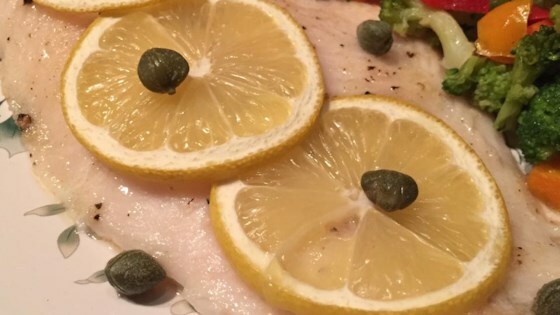 Top fish with lemon slices and capers. Bake in the preheated oven until fish flakes easily with a fork, 15 to 20 minutes. Prepare a healthy and delicious meal in just a handful of minutes. Made exactly by the recipe and it was great. I'm not a huge fan of baked fish, but this was very tasty. Will definitely make again. Very tasty and easy to put together. The whole family loved this dish. Simple and very tasty. We will definitely have this dish again! Delicious! Followed recipe as listed only added a little seafood seasoning. Will definitely make again. This was lovely. thanks for sharing! This is a light and easy recipe. Used limes, fresh garlic and lots of capers. Very yummy!